From a military post (Fort Baker) to a national park, to a world class luxury resort, Cavallo Point has been part of San Francisco's history for over 100 years. Many visitors, and probably many locals, have no idea that the seemingly understated military style structure that sits at the base of the north side of The Golden Gate Bridge is actually the home of a world class luxury resort. Cavallo Point, or The Lodge at the Golden Gate as it is also known, is a member of the Passport Resorts family. This unique company is well-known for establishing resorts that share an innovative design spirit, a dedication to the environment, and a commitment to a unique and soulful experience for you and your guests. You won't believe the views that are available to you for your ceremony. Mission Blue was previously Fort Bakers' historic chapel. The mid-sized facility is perfect for a celebration that has around 150 - 180 guests. The charming building stands alone on a romantic hillside with sweeping views of the Golden Gate Bridge and the Marin Headlands. If the view was not enough of a draw, the interior of the space retains its historic charm and boasts hardwood floors, cedar walls, amazing vaulted ceilings, and a collection of vintage stained glass windows. The outdoor lawn that is adjacent to Mission Blue offers the same breathtaking views of the Golden Gate Bridge. This secluded outdoor area is perfect for creating a gorgeous outdoor ceremony that is light and airy, yet infused with intrinsic beauty. The outdoor space can seat over 300 guests and when combined with a tented outdoor reception in the corresponding Koeber Lawn, this discrete location is a perfect place to begin your happily ever after. This amazing wedding celebration was originally featured on I Do Venues with photography by the talented Julie Mikos. 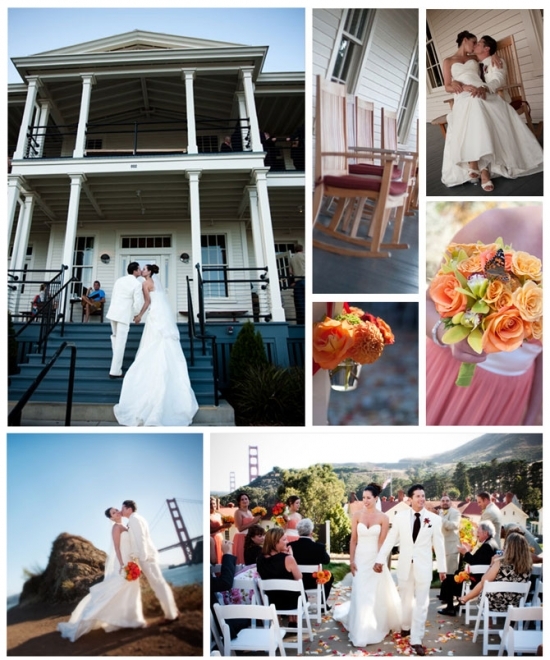 If you'd like to see more of Julie's work featured on our blog, or want more information about Cavallo Point - Click Here!